The time to pack up and hit the road is approaching and so I decided to pack away the five months of creative chaos that has accumulated on my bedroom floor…pattern charts, sticks of various sizes and lengths, swords, shuttles, cable ties, metal rods, pick-up tools, heddle string, sewing thread, yarn, cardboard strips, needles, string. Everything went back in its proper place and I could see the rug again and I didn’t need to play hop-scotch on the way from my bed to the door. But then I decided that there was still time to weave some tiny projects and I started planning a lanyard that a friend has been asking me to weave for her for some time. 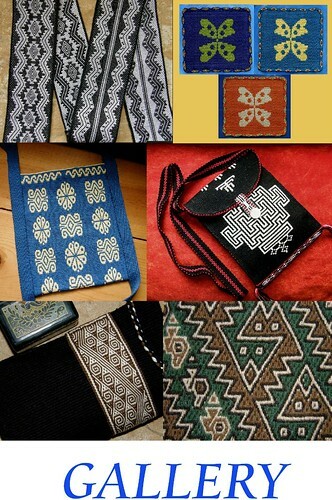 I also want to weave a strap for a pouch that I have been thinking about for years as well as a bookmark that I promised another friend. And, with just that, wouldn’t you know it, I am back to Square One and can’t see my rug any more! The books, and charts and yarn and worksheets are all over the place along with the shoulder-bag project that I continue to sew. This is where I was with the bag project when I last posted. The zipper is in place and sides have been installed. On my weekly visit to the supermarket I was happy to find a long table runner that I could use as the lining material. It looked like it was just the right width and I loved the color and subdued pattern. This seemed to be a safe bet for me who knows nothing about fabric and I was happy to pay a bit more than it would have cost me to just buy fabric in the street market. I doubt that I would have found anything that I liked as much in the market stalls. That un-ripping tool got a workout as I sewed and re-positioned over and over. Now it’s done. This is the opening for the quirky pocket…the one that sits on the outside but is accessed from the inside. I got to use a beautiful button that one of my students made by hand as a closure for the pocket. The loop around the button is an eye-pattern tubular band that I wove. I edged the pocket and the sides with plain-weave tubular bands in blue. Tubular bands are such wonderful finishes. The pocket and sides are so sturdy with those nice firm bands in place. And that is where this project sits until I can get more blue yarn for the straps. I was hoping to use this bag on this trip but that won’t be happening. I’ll come back home with the yarn and weave some nice sturdy straps in the intermesh structure.. The bag is the perfect size for my books! As for the tiny tape projects, a friend asked me to weave a lanyard for her name tag using the cat motifs that I designed for my book of 100 Patterns. My online weaving friend Andrea had designed cats with intertwined tails which she allowed me to adapt to more closely match my own three cat motifs. All four motifs are charted in the book. The lanyard needs to be 3/4”- 1” wide. Here’s the first little guy on my width-sample warp which confirmed that I had enough ends to get 3/4”. I am going to continue weaving this sample and make it into a wrist band for myself while I plan the layout of the lanyard. I’ll probably mix the cat motifs with some paw prints, the charts for which are also in the book of 100 patterns. At the same time, I am getting a start on another band that has been on my mind for several years. 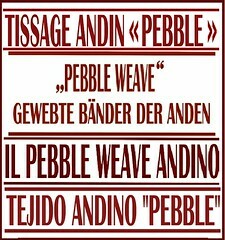 I have been collecting the word “weave” in various languages which I would like to weave into a strap for a pouch. Many years ago I wove and constructed a carry bag for my backstrap bits and pieces and I used weft twining to decorate the strap with just a few words in different fonts. I am using the intermesh structure this time and using just the one font to weave my words. I have about twenty-four words collected now from online friends ranging from Cherokee to the Yoruba language of Nigeria. Kathy King combined patterns from the book of 100 patterns (Complementary-warp Pattern Book) and my very first book, Andean Pebble Weave. She calls her band The Birds and the Bees. I love the blue and brown together. Margo wove this wrist-cuff combining various patterns that are charted in my books, as well as designing some of her own and giving it all an original twist to create a cycling-inspired theme for a friend. I love this! Colleen Turner added a strap that she wove on an inkle loom to a shoulder-bag. 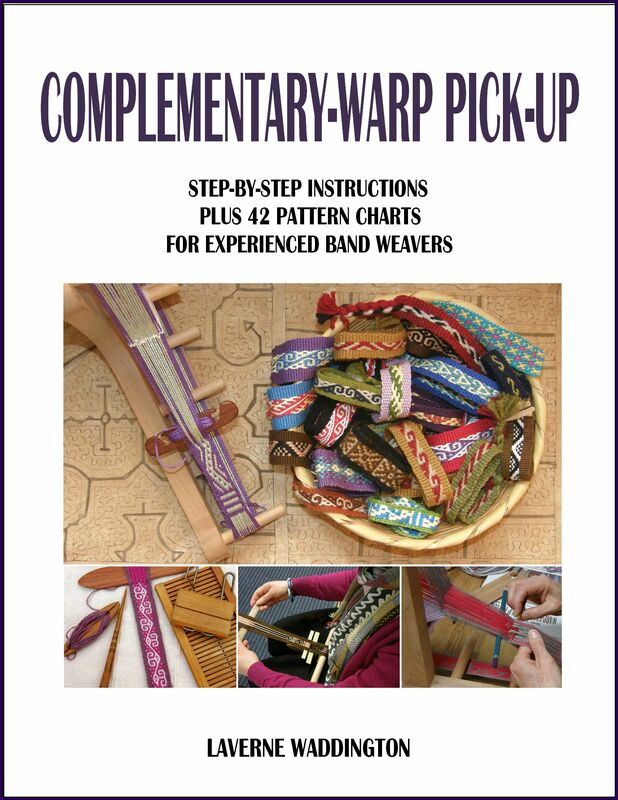 The pattern is charted in the Complementary-warp Pick-up book which also gives step-by-step instructions for those who use any kind of loom to weave warp-faced bands. Marsha’s band in 20/2 silk is spectacular. The red and blue are her own hand-spun threads. She has combined patterns from two of my books and the result is gorgeous! And here is Kristin’s latest piece of awesome-ness in her own hand-spun wool. She has named this “Celestial”. The star pattern is one that was created by Kurt Laitenburger for tablet weaving and which he allowed me to adapt to the Andean Pebble Weave structure for my More Adventures book. I like to call the smaller pattern that Kristin used on the sides “Sunrise, Sunset” and this piece makes me think of a sunset with the evening star rising. The red, orange, blue and yellow all come from natural dyes. Kristin is going to sew this into a long zippered bag for for her backstrap loom. One of my weaving teachers, Maxima, took a liking to this same star pattern when I was up in the highlands. Of all the samples that I took to show her, this was the one that she wanted to learn. We wound a warp and Maxima took over after she watched me weave a few rows. I was able to show Mr Laitenburger how his pattern was being enjoyed on the traditional leaning loom in the central Bolivian highlands. He was very pleased. 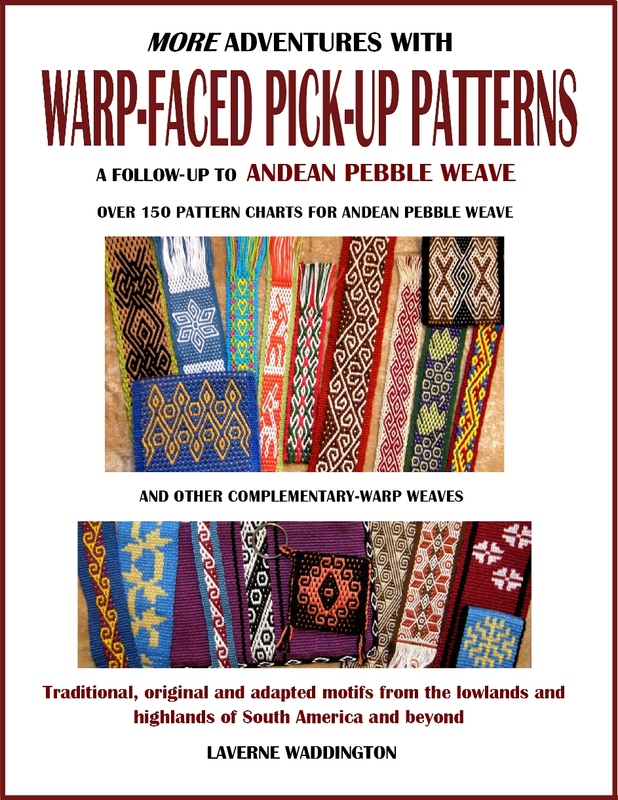 Kurt Laitenberger does beautiful work with tablets and I really appreciate his allowing me to adapt some of his patterns to the Andean Pebble Weave structure for my books. Speaking of tablet weaving, I was looking through some of my old folders on my desktop about which I had almost completely forgotten and I re-discovered some awesome pictures that Taylor had sent me of tablet weavers in Bhutan. Taylor and I had been corresponding by email while she was living in Bhutan and we were able to meet up once in the USA when I was on a visit. She gave me an incredibly fine and stiff tablet-woven band and told me about how some of the tablet weavers use x-ray film to make the tablets for the extremely fine thread that they use. After our get-together, she sent me these photos that she had taken f a family of tablet-weavers. It’s fascinating to see a classic backstrap loom set-up being used with the tablets. I am guessing that the structure that is used for the bands that are woven using this set-up is one in which the weaver does not have to deal with built-up twist in the warp threads. Taylor had been working on a project teaching women to construct tote bags from strips of plastic cut from soda bottles. I think that you can just make out the green handle of one of the bags in the foreground of this photo in which the weaver is preparing her warp with the thin film tablets. I love the rocks and the weights that she is using to hold her stakes in place. I managed to scavenge an old paint can filled with cement that I sometimes need to use when I warp using certain set-ups. Until next time, let me leave you with this message: A limited number of hard copies of all my books in English will be available while I am traveling. Please leave a comment on this post, if you are interested, and I will get back to you. I’m so happy I signed up for your blog notifications! Seeing all this beautiful work is so inspiring! Thank you, Caroline. Some of your own creations have served to inspire others here too. 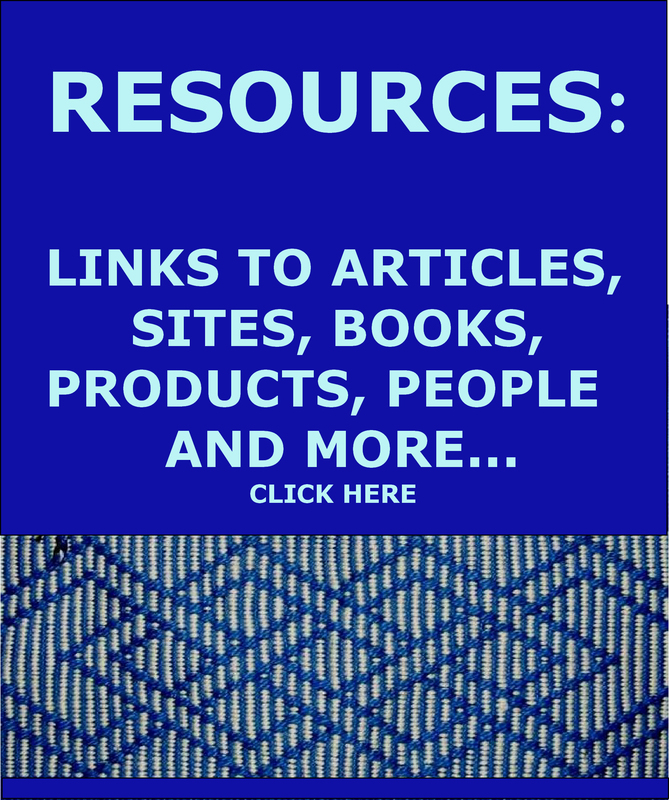 Hi Laverne, I just love to immerse myself in your blog and try your ideas and methods. I was stunned to see the weft twining. Would you consider doing a tutorial on this method? Is it possible to do it using an inkle loom? Not being an experienced weaver and too old to learn new tricks and adapt on my own, I would love to have a hand to help me. There’s an out-of-print book that teaches it with very good instructional drawings….Taaniko by Joyce Ronald-Smith. Thank you, I will try to find it. I am amazed that you respond to comments so quickly. This is quite extraordinary. I am having so much fun just working through your books and I wonder if I will return to my floor loom, EVER! Found it on Amazon!😊. I hope it reaches me in South Africa, which is always doubtful. Thank you very much. Awesome! Fingers crossed that it arrives! I am absolutely enjoying learning to weave on a backstrap loom with the help of your blog and Ravelry group. I had no idea just how versatile this simple loom is. It is simply amazing! Thank you for making learning the techniques so accessible and easy. Creativity at its best! I especially like seeing your bag construction, as I will be constructing one if I ever get the weaving done. Have a great trip!